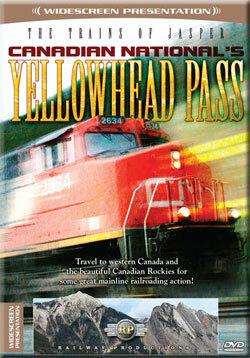 Travel to western Canada and the beautiful Canadian Rockies for some great mainline railroading action! 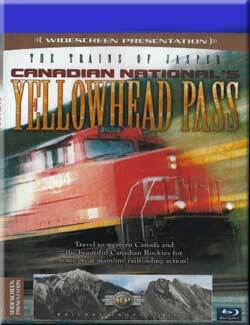 Canadian National's transcontinental mainline passes through Jasper and crosses lovely Yellowhead Pass, the continental divide. 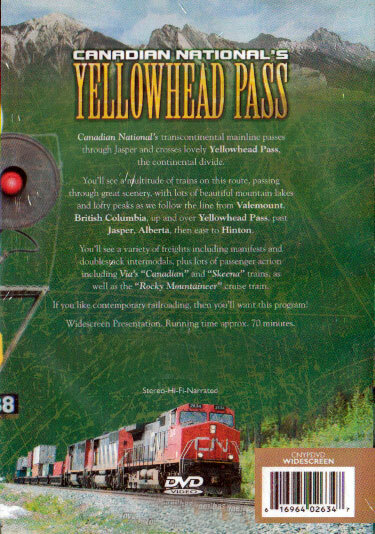 You'll see a multitude of trains on this route, passing through great scenery, with lots beautiful mountain lakes and lofty peaks as we follow the line from Valemount, British Columbia, up and over Yellowhead Pass, past Jasper, Alberta, then east to Hinton. You'll see a variety of freights including manifests and doublestack intermodals, plus lots of passenger action including Via's "Canadian" and "Skeena" trains, as well as the "Rocky Mountaineer" cruise train. If you like contemporary railroading, then you'll want this program! Widescreen Presentation. Running time 65 minutes. Bob P (Utah) on 2012-05-04 20:23:36. The focus of the production was clearly on the trains. I would have preferred a production that focused on the scenery along the route. Rail Buff (Southern California) on 2016-03-02 21:30:11. Agree with prior reviewer that this was focused on trains. Nevertheless there is beautiful scenery too. About half the trains were passenger trains including several shots of each, Rocky Mountaineer; Skeena; Canadian. I know passenger trains don't suit all but nevertheless an enjoyable Blu-Ray.